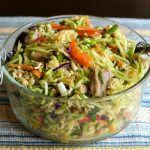 This is an Asian inspired coleslaw recipe that gets a wonderful crunch from the ramen noodles. sunflower seeds, and almonds. The coleslaw mixture is comprised of crunchy broccoli, green onions, and red bell pepper. A versatile recipe you can make to your liking. In a large mixing bowl, combine the broccoli slaw, ramen noodles, sliced almonds, sunflower seeds, red pepper sticks, green onions, fresh parsley, and toss to combine. In a small container combine the oils, white wine vinegar, honey, and the salt and pepper. Whisk to blend. Pour the dressing over the ramen salad and toss to combine. We used the 3/4 pound cubed chicken breast salt and peppered then sautèed in 1 Tbl. olive oil for about 5 minutes. We added this to the slaw and served it warm. It was delicious! !